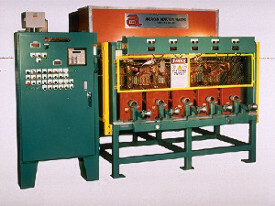 Ajax TOCCO Magnethermic is the World leader in the design and manufacture of induction heating products including those for bar end heating applications. Higher production rates can be achieved with the use of multiple solenoid coils while channel coils facilitate material handling of long bars through the use of chain conveyors to continuously feed the bars through the C-shaped coil. 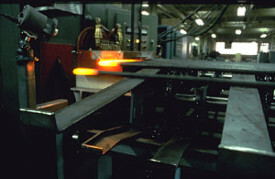 Ajax TOCCO Magnethermic also offers a compact unitized bar-end heating/forging system. 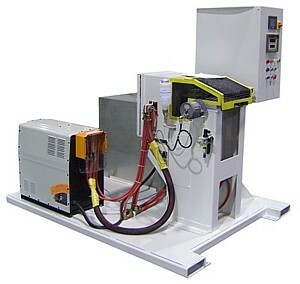 The system is complete with process controls, power supply, water cooler/recirculator, and heating inductors all mounted onto a unitized welded base, making installation very simple. All that is required is to fill the closed loop water cooler with coolant and connect a 3-phase voltage supply. Ajax TOCCO Magnethermic’s 35kW air cooled induction heating power supply is capable heating up to 115kg of steel per hour based on an 1100C temperature rise. 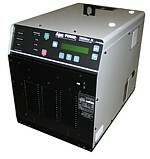 Additional power supply offerings are available for varying production.